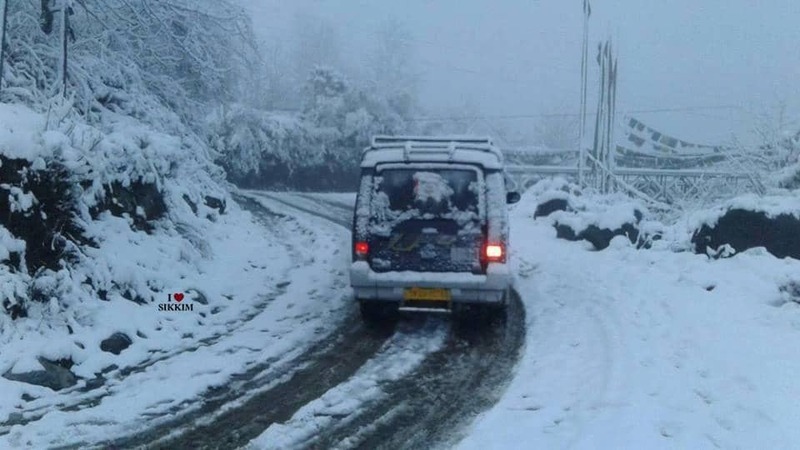 On Friday 28th of December heavy snowfall in the upper ridges of Darjeeling and Sikkim had left nearly 2800 tourists stranded. Completely cut-off, with biting cold that was starting to freeze everyone, they had almost given up hope. When the incredible jawans of our Indian Army launched the biggest rescue operation by the army in Sikkim’s recent history and saved them. 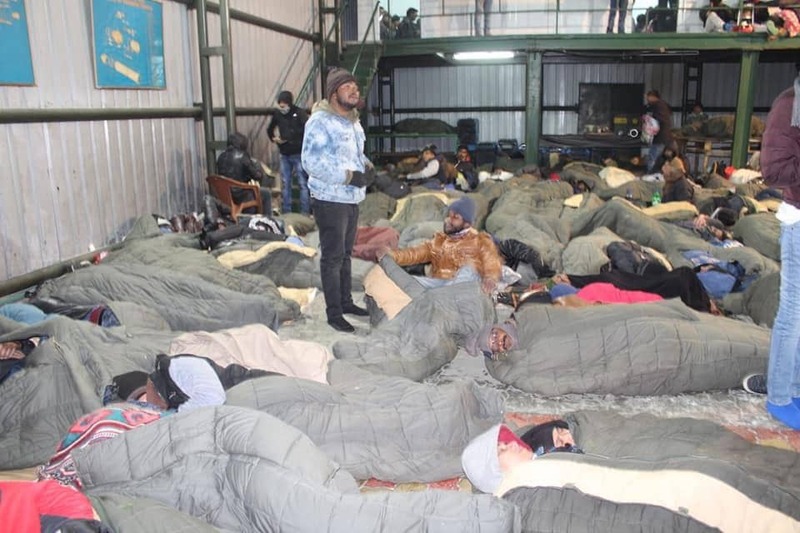 The tourists, included elderly people and children, were provided shelter and food in army facilities. Among the tourists who were rescued, 90 people fell ill and were taken to safety in ambulances. One of our readers Aryan Ahmad who was present there and rescued from Changu lake by the army, following heavy snowfall in the region, wrote to us this short letter. “I am Proud to share these pictures of our Army, they rescued 2800 people from Changu/Tsongmo lake and kept all peoples at there 17mile TCP camp. I was too present and was the victim of this sudden snowfall, when people had lost all hope of remaining alive, at around 6PM our army launched a rescue operation whole night and rescued all the tourist who were trapped at Changu and nearby Maba Mandir. 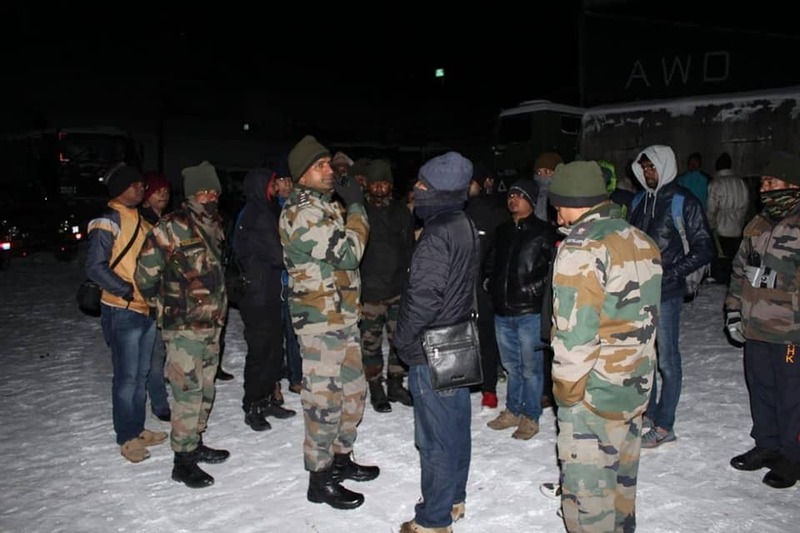 64 Comments on "Jawans of our Indian Army slept outside in -9° to keep us warm"
Salute to our Indian Army Brigade posted at Sikkim. When I was traveling to Changu Lake with my wife and two kids during Summer there was heavy landslides on the way. DRO and Army came forward. All the Army vehicles were also stranded. The army officers advised us to wait and they went to their destination by walking through steep road. We should learn Leeson from them. Who ever wishes to sincerely support, do visit an organisation link below to be associated who is working for them. I wish more people could be informed about this brave deed and made aware of what we owe to the army. We use the army for everything thats tough going because we know they are the only people who will do us proud but when the work is over or people have retired we care a dime—like in my case–I’m still awaiting all the Life Time Arrears of my late father, General Kabraji & the Bank of India cares two hoots—I have been running around for the last 5 years trying to get them to credit all the LTA–So lets imagine the plight of a poor jawan’s family who also is made to run around like this ? Of course, the army has done a mighty fine rescue operation & they will keep doing it regardless of how we treat them now or even after they have retired or passed away. Hello Sir… Refer ur post someone in trail had a comment to approach him, is in quotes. “…Please talk to me at 9840223170 to get your dad’s dues. Hope this to be helpful for you. Thanks & respect for the services by ur father to the nation. I m proud of our army. I only feel shame for some of our media persons who are always blaming our army. They will shut their eyes to see such kind of deeds. Yws. We are proud of our Indian Army.But has the system of Nation changed to help them after their retirement.For example read the plight of Zal Rustam above.There are numerous such examples.The system as well the attitude of Babus need change. Look,the veterans who did the same yoeman service during his life time in uniform are on the footpath of Janter-Manter for the last 1285(as on 29 Dec2018) days demanding their legitimate demand of One Rank One pension,slowly and grdually degration of their honour pride pay perks. Hats off to IA.Jai Jwan Jai Hind. Please show this article to mr Nasiruddin and ask him if he feel his children are safe of not in India. Any amount of praise of our jawans is less as compared to their sacrifice.Wishing them all the best.Dr. Salute to brave heart… Indian Army is the best out of all. In war or peace it is our Armed Forces that always come to our rescue. Hats off to them. We are indeed proud of these bravehearts. Please talk to me at 9840223170 to get your dad’s dues. Salute to selfless and untired jawaan of this country who are performing best in all conditions.Mother India is proud of you all.Jai Hind. The soldier and the farmer are only praised on times of difficulty. Once the difficulty is over they are all forgotten. The politicians might want to cut the soldier and farmer to size, buy it is the silence of the masses when such things take place that actually does them harm. Bless the soldier and farmer everyday cos without the former you cannot sleep safe and without the latter you cannot eat. This is the Irony of our Soldiers.Every citizen of our Country always respect them except anti Indian gang of our Country. It is an honour to live in a country where you know that there are these brave souls who risk it all to ensure that we are safe .. A Salute to all those HERO’s who gain no recognition nor accolades for their sacrifices and untiring selfless service 🙏🙏 .. God Bless them and their Families ..
Great job they have done for our country;they have deployed even Siachen of -40°c(day)& -70°c(night)! I was on Nathulla Pass on the 27th. Temperature was -8 degrees at 12 Noon!! Heavy wind was blowing but no snow storm. But when we were returning at 2 PM, there was a blinding fog and sleet formation on the road. 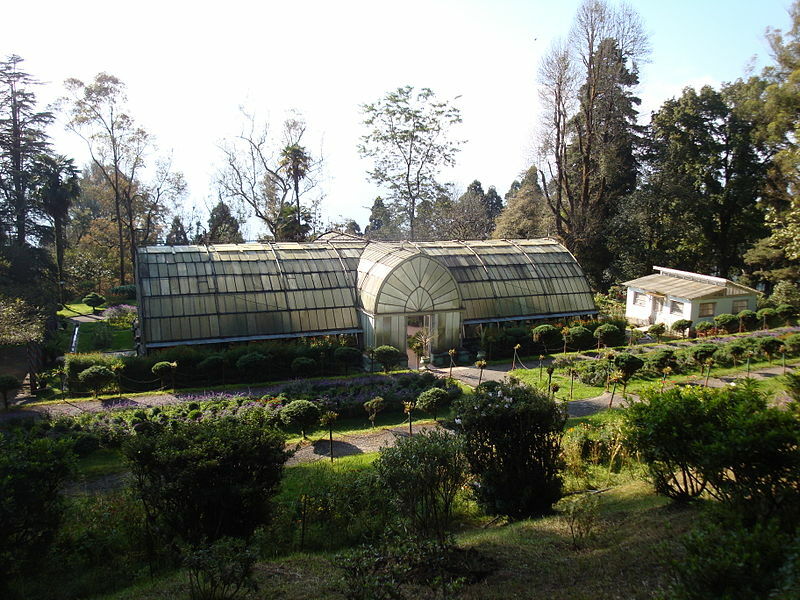 Cab driver was very worried (almost panicky), stopped our lunch half way, bundled us back into the cab and took 4 hours to travel the 35 KMs from the Tsomgo Lake to Gangtok city—that too downhill. When we went out to market M G Road at 8:30 PM for dinner, the phone measured +1~2 degrees and it was almost impossible to walk for just 10 mins back to hotel. To spend a night at -9 degrees in a storm would have been real hell. Great humans are our soldiers. God bless them. Don’t give publicity of this noble deed because Pappus , Secu & Makus will say that this is A propaganda by Modi for political gain. Hats off to Indian army..Very proud to be Indian..
Our military is one of the greatest institutions in the world. Underappreciated, yet prrforming its duties even to the extent of sacrificing their lives for others. They deserve our full support and respect. Jai Hind! It would have been better if the Media had reported. But main thing is this that people of India realise that This is still the only organ of the state that is still considered to be honest friend of us the people. We realise that too in our day to day life. I recall an incident after Kargil War. We were q-ing up for railway reservations at Jalpaiguri Station. 2 jawans wanted to buy tickets and did not have time to stand in Q. They requested for allowing them. Some protested that they shoul stand in Q. But suddenly most others in the Q spoke up and let the Jawans buy the tickets first. It was such a small token of gratitude and a very heart-warming situation. In the heart of our hearts we are grateful to the Jawans, as we should be. Thanks I salutes Indian Army.I have no words. Kudos to our esteemed bravehearts for their courageous effort to save so many humans irrespective of their religion, caste and creed. Not a word of praise coming from our shameless political leaders. The Indian Army always helps the civilians even at the cost of their lives.My Salute to the Indian Army. Proud of our Jawans who alone, in the whole country give us the pride to be Indians. They work silently and silently instill unity among we Indians. Another cause to be proud of them is that there has never been a report of Hugh handedness during their service. They always served with humility. When you tuck into your warm blanket in your bedroom at night just remember our army brothers are freezing at minus 70 at Siachen. That’s all. Our Amazing Army boys in action once again ! Real life Super Heroes. God Bless our Indian Army. Jai Hind. Kudos to the Indian Army. They deserve everything.. Proud of our Indian Army. We were supposed to be there next day as per our schedule. 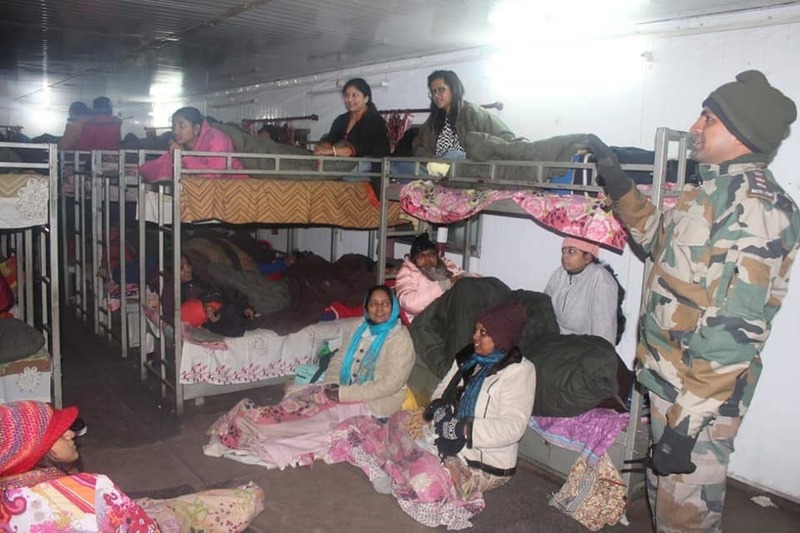 God is great… Hats off to our army who stayed outside at -9 by giving away their beds to civilians. No words can praise their sacrifice to our country. Hats off to all of you sir. We realise the sacrifice of a defence person only when we have one in our family and during crisis or when we live near the border.Every Indian citizen should work in defence atleast for a short period in there life time. Jai Jawan. So. many have commented.I have nothing more to add except to say this require s more media publicity and govt appreciation publically. How humanity saved many lives,and our army should be thanked for the service they have rendered to our people. 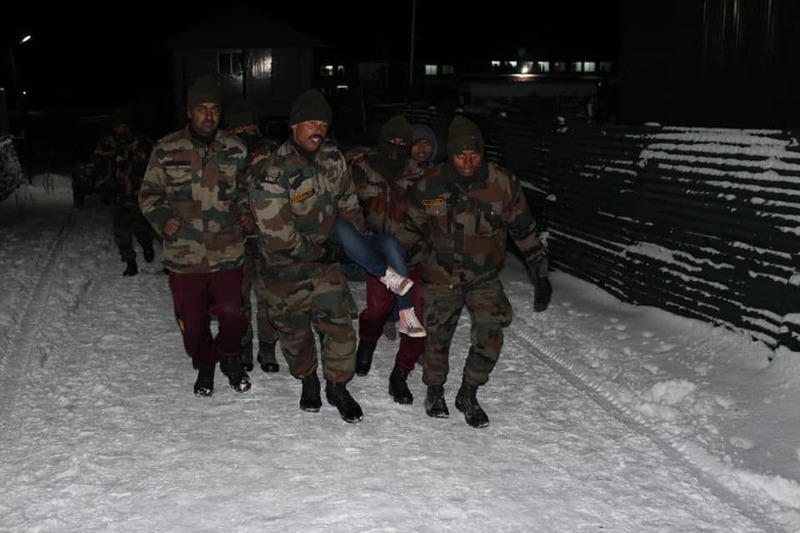 Commendable effort by Indian Army for this rescue operation done at Changu lake . 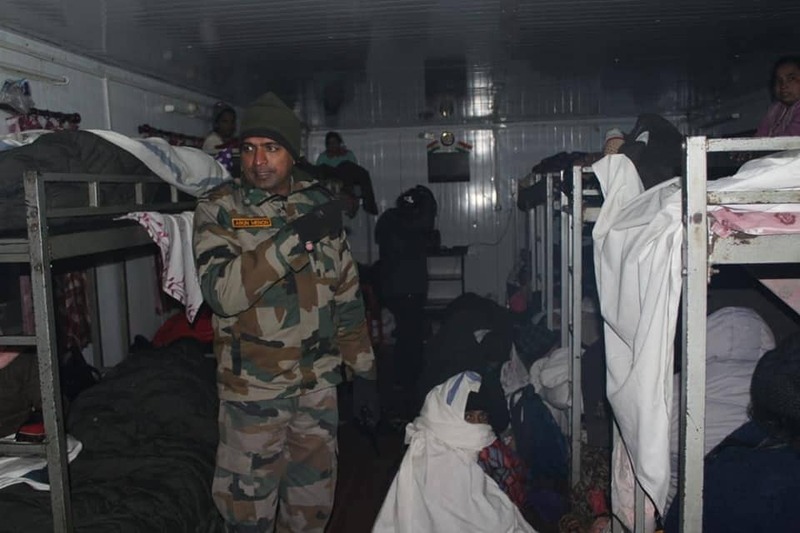 We in a group of 8 were lucky to be very close to the transit camp 236 when this calamity hit the region…Hats off to the Jawans who lend their own beds and shelter happily to save us from the rough conditions. They did all the possible work to help civilians reach the shelter safely. Feel so proud to be an Indian …JAI HIND!! Our salute to our great army men. I am proud to be an Indian. The media does not report such information. Only where there is mistake they will publish in front page. They are having such negative mentality. The IAS officers also not willing to see the reality and think they are superior. We are proud of our army, their act is a sincere slap on the separatists and stone pelters who condemned our army every now and then. Did army askEd cast of any of the tourists? Salute to our great saviours and protectors of our Country. Indian Army Jawans we owe you every thing. Thank you for being there for us. I as a retired veteran can only say to to assure the nation, that we have taken oath to lay down our lives for the safety of our people and the nation.MY ONLY REQUEST TO THE PEOPLE,THAT WE DO WANT TO BE SHOWN GRATITUDE FOR OUR WORK.BUT WHAT HURTS THE SOLDIER MOST AND BRINGS DOWN HIS MORALE IS UNGRATEFULNESS BEING SHOWN FROM ITS OWN PEOPLE. Proud of our jawans . I pray good health and prosperity to the jawans and their respective families. I am very proud to be an indian. 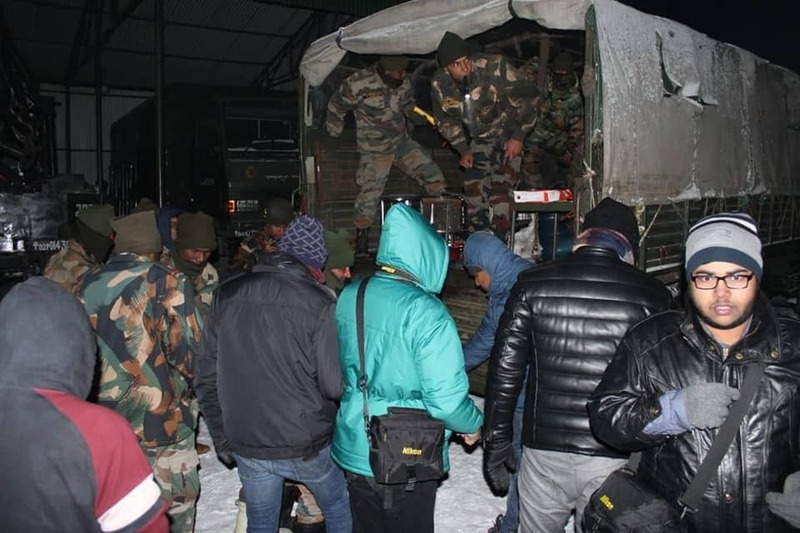 We r seeing & hearing the things done by ourvpride jawans in that -9degree celsius, they shared their bdds rugs & all to the survivors, who can do rather then our jawans, hats of to our indian army by having these brave soldiers. Vande matharam, jai jawan. Jai hind. I Salute to Indian Army, we are proud of you. Indian Army always does this type rescue not only in India but all over the world . We are really very proud of our armed forces. Secondly you ser the picture how the indian army persons rescued the civilians. After all your government do not sanction orop to the defence persons till now. This is a serious one of the serving and retired persons who are alive and their widows are suffering too much do not sanction the proper orop means equalisation of pension to the retired defence persons these difficulties are seing the serving soldiers in leh ledakh and siyachin glacier. So do the needfull help to the retired defence persons at your end sir. Our soldiers are proud of our Nation we are safe,sound,happyand celebrating all our festivals only when our brave solfiers are safe guarding our boundariers.Secondly we are enjoying snow fall,and other winter games when are aware that in the adverse conditions we will be saved by our Great Soldiers if any Natural disaster is there .May it be Kashmir or any other part of the nation without taking into consideration that they may piltering stones on Indian Army. May Almighty God bless all my Soldiers. Pl refer your post. You are right lot of Soilder and Vir Nari are not getting their achual pension due to negligence of PDA and particularly the official of Bank of India, though there are so many Agencies to help them. Myself is Veteran Seargent K N Prasad in case you need any help to short out to get LTA of your father may contact on 7992359706, always ready to help to solve the problems of Pensioners.